Providence, RI (7/10/2018): Pete Demers, who years ago was a young "Rink Rat" in the old R. I. Auditorium at 1111 North Main Street, will be presented with the R. I. Reds Heritage Society's R. I. Native Born Hockey Achievement Award for 2018-19 at Goddard State Park in Warwick on Sunday, August 5. Way back when, Demers earned free ice time by hanging around the old arena and doing odd jobs like cleaning the ice surface, sweeping the stands, and helping out in the locker room. It was with the latter where he met the Reds' George Army, famously recognized as among the greatest trainers in hockey. Army was a grizzled veteran in the games of baseball and hockey. He was self-taught in his profession and expected the same with any burgeoning protégé. He was demanding almost always, but patient in his own way at times when needed. From Army's clear examples, Demers soon learned that study and understanding of the tasks, plus hard work and dedication, were the keys to becoming a physical trainer in sports. Appreciating Demers’ youthful performances to tasks, Army led him to his first trainer's job with Columbus of International League, and later with the Springfield Kings in the AHL, top affiliate of the Los Angeles Kings of the National Hockey League. With that connection the youthful trainer seized opportunity starting in 1972. For the next 34 years Demers served the NHL Kings and became one of the most respected hockey trainers of his time. During his tenure the Kings won two Stanley Cups (2012 and 2014) for which he proudly bears commemorative rings. He retired in 2006 and was rewarded for his achievements in 2007 by being inducted into the trainers' wing of the Hockey Hall of Fame in Toronto. There he joined Tommy Woodcock, another Rhode Islander and protege of George Army. As a unique coincidence, Demers will share the spotlight at this year's reunion with his mentor, the late George Army, who will be posthumously honored with the 2018-19 Tops Award, the Society's most prestigious honor that is named in memory of Zellio Toppazzini. The annual Sunday event, which starts at noon, will feature introductions of each hockey hero on stage, the Society's annual awards presentations, a delicious buffet dinner, music, raffles, and a silent auction of valuable hockey memorabilia. Cost is $35 per adult, $15 for children. As an added weekend treat for fans, the reunion's annual dinner dance on Saturday will feature guest speaker Jack Edwards, Boston Bruins’ broadcaster, at the Chelo’s banquet facility on Post Road in Warwick. Tickets are $50 per person. 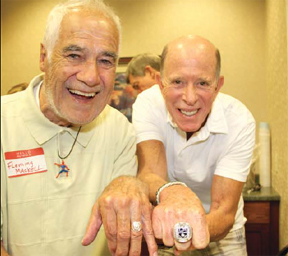 From left, Fleming Mackell and Pete Demers show off their championship rings at a recent Reds Heritage Society Reunion. Demers won his with the Los Angeles Kings. Mackell won his with the Maple Leafs.